The Digital Services Division (DSD) of Associated Newspapers (ANL) provides all online development and infrastructure services to ANL's online portfolio of newspaper web sites. For DSD, the ability to turn around new websites and feature releases without disrupting website availability were essential to maintaining a leadership position in UK online news. 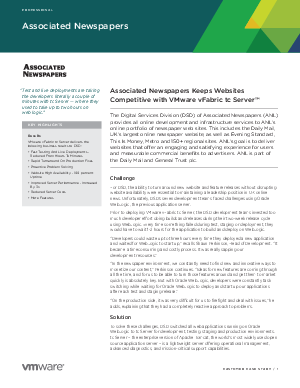 By migrating all web applications to VMware vFabric tc Server, DSD achieved fast testing and live deployments, rapid turnaround on production fixes, proactive problem solving and high website availability.